That was all I said to the team here at Edison HQ as I handed out packs of EdCreate. Because that’s all I needed to say – that was the whole challenge. Simple, right? ‘A little too simple’ you might be thinking. What possible value can such a straight-forward ‘challenge’ have for teaching STEAM, you ask? Spoiler alert: the answer is, a whole lot. Working through these steps is how engineers solve problems. Teaching students to work through these same steps in hands-on problem-solving activities not only teaches engineering but a range of other skills across maths, science, critical thinking and more. Sometimes we need to figure out what, exactly, the problem we are trying to solve is. Other times, it’s very clear. For the pen challenge, the problem is already defined: we need to attach a pen to Edison. What does the end product need to do? What can it NOT do? What materials can we use? What’s off limits? Questions like these help us understand the criteria and constraints of the project. 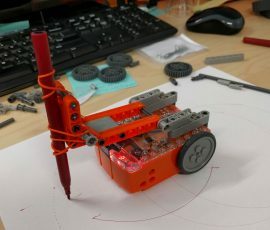 For the pen challenge, we have one criterion already defined (the Edison robot needs to be able to draw a shape) and one constraint (the pen needs to be attached using EdCreate). Get the creativity juices flowing for this step! Coming up with ideas of what ‘might’ work is a brilliant mix of creative problem-solving, critical thinking, and the application of prior learning all in one. No need to be silent either: this step is a natural place for collaboration, communication, and teamwork. For the pen challenge, our team tackled this step individually. Some people jotted down notes, some drew quick sketches, while others looked at examples of other builds using Edison. Everyone tackled the problem in the style that worked best for them – just as it should be. There are no wrong answers in brainstorming! Once you’ve got a few ideas, and at least one idea that seems plausible, it’s time to choose your starting point. And I do mean STARTING POINT. Choosing an approach doesn’t mean you have everything sorted out yet – it’s simply looking at a series of options and selecting the one you want to go with. With an idea in mind, it’s time to get building! Chances are, adjustments will be needed during this step. In fact, you may determine your approach won’t work and decide to go back a step to choose a new approach. That’s exactly what some of our team experienced during the pen challenge. Everyone ended up either making modifications to their original approach or going back a step and choosing a whole different direction. One team member (an engineer, I might add) started from scratch three different times! At the most basic level, this step is as simple as asking ‘does it work?’ Easier said than done! 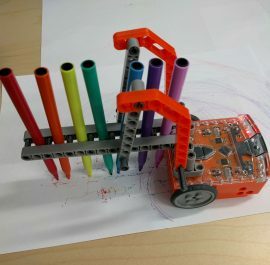 In our pen challenge, with designs in various states of build, people started programming each Edison creation to get the robots to draw a shape of their choosing. Some of the programmed builds sort-of worked, but many did not. Adjustments to the builds, the programs or both were made over and over. 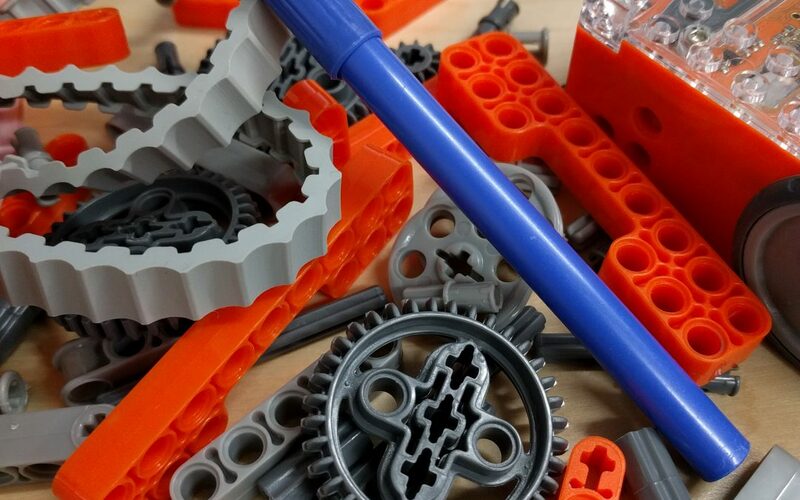 Engineering design isn’t about getting the ‘right’ solution the first time. It’s about creating a solution that works through experimentation and multiple iterations. And there is no ‘right’ solution. Open-ended challenges do not have a single correct answer. From the same starting point, using the same materials, the same rules and the same goal, many different solutions are possible. Don’t let us have all the fun! 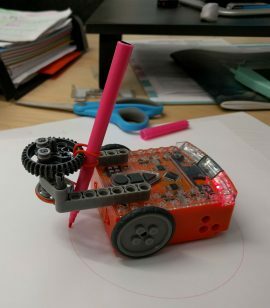 Why not try the EdCreate Pen Challenge in your classroom? 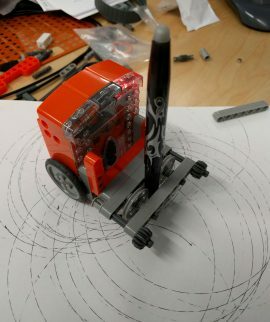 We’d love to see what your aspiring engineers create! Send us your ideas, pics and videos at social@microbric.com or add them to the online community of Edison awesomeness on Pinterest, Facebook, Twitter, Instagram or YouTube.